Italy is as varied as it is beautiful – you can shop till you drop in the famous fashion capital Milan, immerse yourself in history and romance in Rome, get cultured in the museums of Florence, or explore nature at the idyllic Italian lakes. Whether you're looking for a city break or some beach action, find out where to go in Italy for the best pizza, pasta and gelato, of course! Here you'll find your must-see guide to amazing Italy, so you can start planning the holiday of your dreams. 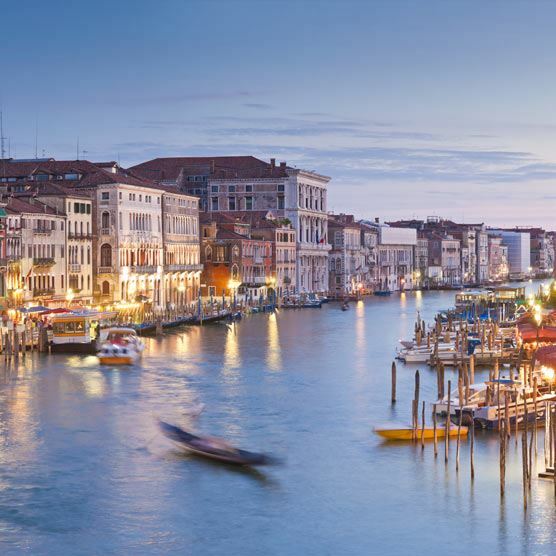 Mesmerising Venice sits in the north of Italy and is famous for being a ‘city on the water’ as it’s made up of over 100 tiny islands, separated by canals and linked by a network of bridges. Venice makes a magical place for a city break, particularly if you visiting on a couples holiday, with its grand palaces appearing to drop directly into the water. Don’t miss the city’s famous Doge’s Palace, St Mark’s Square and its gold-topped basilica, and the iconic Bridge of Sighs. Want to whisk your loved one away on a luxury couples retreat? Take a look at our top 10 romantic getaways in 2017 - you're sure to woo them with our wonderful destinations! Rome is as grand and impressive as you’d expect Italy’s capital city to be. Its legends, architecture, culture and history means there’s lots to do and see, including the world famous Colosseum, the ancient Roman Forum ruins and incredible churches including the Pantheon and the Sistine Chapel. Within Rome you also have Vatican City, the majestic headquarters of the Catholic Church and home to St Peter’s beautiful domed basilica. Wandering this pretty city brings endless delights and surprises, from the ornate Trevi Fountain and famous Spanish Steps to gelato shops offering hundreds of different flavours. If you want to find out more details, take a look at our advice for travelling to Rome. Pisa and Florence are the two biggest hitters in the Tuscany region, which boasts rolling countryside, pretty villages, vast olive groves and some stunning Blue Flag beaches along the coast. Florence is a classy city break for those who enjoy good food and beautiful sights. It’s dotted with bustling city squares where you’ll find palaces, places of worship and galleries galore (including the Gallery of the Academy where you can see Michelangelo’s David), but its most famous landmark is the red-domed medieval cathedral. Head here in April, May or September for beautiful weather. The line-up of gorgeous Mediterranean resort towns on the Amalfi Coast are incredibly photogenic, sprinkled with multi-coloured villas stacked up against the steep cliffs. Sorrento, Positano and Amalfi itself are three of the best. You're likely to find Medieval architecture, lush olive grove landscapes and candy-coloured towns lining this UNESCO-listed coastline, not to mention the glamarous harbours by the beachfront. This is the place to be seen in the summer months. The Amalfi Coast is perfect for island-hopping, so board one of the many boat trips and explore the amazing coastline. Lake Garda is the largest lake in Italy and is surrounded by some of the country’s most gorgeous natural scenery. For spring, summer and early autumn trips, you will be spoilt for choice. If you want to escape the hustle bustle of the big cities, glorious Lake Garda, with its peppering of lakeside villas, is the place to go. Expect stunning countryside dotted with pretty towns and crumbling castles. The Gardaland Themepark and Caneva Aquapark make good family holiday outings too, especially if you’ve got kids who aren’t so keen to pull on their hiking boots! Italy’s ‘northern capital’ Milan is known for being a city of fashion and design – so needless to say that shopaholics will be in their element! The ornate Corso Vittorio Emanuele II shopping mall, the exclusive Corso Venezia avenue and Corso Aires, thought to be Europe’s longest shopping street, are good places to start. Besides retail therapy, Milan also offers up some amazing art and architecture – you can see Leonardo da Vinci’s ‘The Last Supper’ in the Santa Maria church, and the city’s cathedral, on its famous Duomo Square, is breathtaking. Most visitors to Pisa gravitate towards the city’s most famous landmark, its leaning tower. This architectural mistake is also worth seeing if you’re visiting Florence, which is around an hour away by train or 40 minutes by car. Don’t forget the obligatory photo of you propping the tower up! Sail down the Grand Canal on a gondola and you’ll get the picture perfect snapshot of Venice. Keep your eyes peeled as you pass beautifully ornate palaces, waterside churches and float under the Rialto Bridge for a true taste of the Italian Dolce Vita. Step off the boat and take a stroll through the citys pretty piazza at St. Marks Square for a glimpse of the enchanting chapel of Basilica di San Marco, a perfect example of Byzantine architecture, before stopping to wine and dine at one of the pretty pavement cafes. One thing that Italy does brilliantly well, besides ice cream and enormous pizzas, is churches, and whatever town or city you choose to visit you’re almost guaranteed a gorgeous basilica to admire. Rome is a treasure trove of historical and archaeological delights, with the Roman Forum and the Colosseum amongst its most prized gems. The landmark Roman amphitheatre famously hosted gory gladiator battles, while the Roman Forum makes you feel like you’re wandering back through time as you pass the crumbling remains of this ancient city. Whichever destination you fancy for your not-so-mini Italian Job adventure, there is something for everyone when you book a break to Itay’s boot!